Fun never ends at Holy Heart, as an exhaustive programme is followed to make children play and learn. Here children’s minds are sharpened, energy channelized and developed through a variety of purposeful activities like role play, dramas, drawing, painting, rhymes, singing, block building, fun games, fancy dress etc. International, national and local days are celebrated to spread awareness amongst the children and educate them about the world they live in. Besides this, the students celebrate unique functions like Republic Day, Children’s Day and festivals like Diwali, Gurparv, JanamAshtami, Baisakhi, Christmas, Dussehra, Teacher’s Day, Holi, Basant, Rakhi, thus embedding secularism in children, which is the foremost motive of the school. The school appreciates India’s diverse culture with enthusiastic celebrations all the year around. 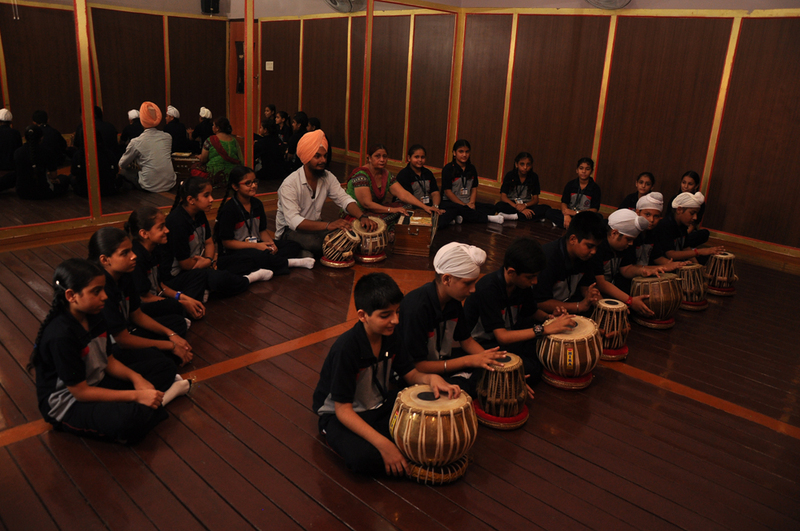 The student activities programmeis an integral part of the total school educational programme. It is a progressive experience that will prepare students for their future. School is more meaningful and enjoyable when a student becomes involved in the activities programme. Whether the activity is being part of a club or an organization, a special interest group, or student government, it is an opportunity to make friends, to learn some important social skills, and to take part in fun activities. Most of the activities require only an interest, some a try-out, others a special skill, but there is something for everyoneand new clubs and organizations are always welcome.The School embraces the importance of providing a well-balanced activities Programmeto augment the learning activities of the classroom. Student Activities Programmesteach and reinforce, through empirical learning, lessons consistent with the HHPS student achievement goals of academics, essential life skills and responsibility to the community. Life lessons such as teamwork, goal-setting, time-management, sportsmanship, commitment, and leadership are taught through daily experiences and prepare students for future life challenges. Opportunities are provided at all levels and include participation in activities such as publications, student government, performing arts, honour societies, and special interest clubs, in addition to opportunities for student growth and enrichment through athletics and sports. Activities including publications, student government, performing arts and special interest clubs activities. The elementary level provides opportunities for students in publications, student government, and performing groups. At the middle school level, HHPS provides for involvement in performing groups, student government, newspaper, yearbook, drama, general interest clubs, and the literary magazine. At the high school level, HHPS offers a wealth of opportunities for student growth and enrichment through athletics, student government, performing groups, publications, honour societies, and special interest clubs. Activities are implemented so that youth have greater opportunities for success in developing the attitudes, skills, knowledge, and abilities to live healthy lives, become productive adults, and to thrive in the workplaces and communities of the 21st century. Impact: Research shows that youth with the opportunity to build positive peer and adult relationships have better school and community connectedness, better school attendance, increased social competence, and less substance abuse and behavioral issues. Research also indicates that school activities can markedly increase engagement in learning, improve academic achievement, and reduce behavioral issues. These assemblies, in all phases of schooling, make a positive contribution to pupil self-development and therefore are at the heart of raising achievement and standards. They encourage pupils to reflect upon a set of universal values, such as love, peach,truth, co-operation and respect. These values act as the foundation for thedevelopment of personal, social and health education, citizenshipand the spiritual, moral, social and cultural aspects of the curriculum.